Latest Government jobs for Trainee posts under Heavy Engineering Corporation Limited organization under Government of India. HEC Ltd, organization established in the year of 1958. HECL company is one of the largest Engineering Complex in India. This organization deals in the manufactures and supplies capital equipment, machines and renders turnkey project execution services required for the core sector industries. HEC Ltd. has decided to introduce three years Training Programme to ITI qualified, Diploma Engineering Holders and Graduates from various disciplines. Related to that they issued an official notification in which they are inviting all Indian fresher candidates to apply for this recruitment process. This is a unique initiative that aims to offer young technocrats meaningful, industry relevant, skill based training. Under this scheme, the trainees will be offered a monthly Stipend and a certificate on successful completion of training, which will help them in securing a job in related industry based on their qualification and exposure obtained through this training program for a better future. More information related to these Government jobs is given below in this article. Read the complete article carefully before applying. MBA with specialization in Personnel Management/ HR/ Finance or equivalent from recognized University or AICTE/UGC approved course with first class 55% of marks or equivalent CGPA. For SC/ST/PWD candidates, it is 50% of marks or equivalent CGPA from a recognized University/ Institute. B. Tech in IT / MCA or equivalent from recognized University or AICTE/UGC approved course with first class 55% of marks or equivalent CGPA. For SC/ST/PWD candidates, it is 50% of marks or equivalent CGPA from a recognized University/ Institute. Age Bond: Applicant age must be less than 28 years can apply this recruitment process. Paying Method: Pay the Examination Fee through one of the following method: “Debit Card, Credit Card, Net Banking or Pay Offline Through E Challan”. Choose one of these method which suits you for the payment of the application fee related to this recruitment process. 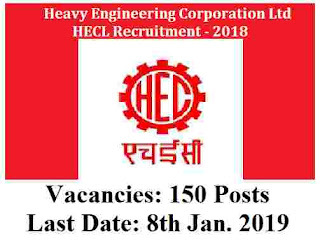 Disclaimer: We took this information from the official file whose link is as follow: “http://hecltd.com/jobs-at-hec.php” . So all rights of the information which we shared goes to this website only.